We all Want to be like Google, Right? The story begins in 1998 and reaches its climax in 2008. Fortune magazine ranked it among the top 5 most admired companies in the US. There were accounts of three meals served per day by leading chefs, a gym that was always open, free shuttle service and dogs close to their owners. It was Google who dazzled the onlookers. So how can other companies aspire to succeed like Google by implementing a culture of innovation? In my experience spanning various industries, the bed-rock of implementing a culture of innovation is usually the freedom that companies give their employees to accomplish meaningful results in their work life; a work life fulfilled with accomplishment, a sense of belonging to work, and a culture that rewards employees to behave and think more innovatively. So what are some of the levers to pull? Teresa Amabile has some interesting insights from her research on what motivates employee creativity, in her seminal book, The Progress Principle. Some of the key points are summarised below. The research shows that people think more innovatively when they feel happy, and when they think highly of their projects, co-workers, managers and organization. The joy that employees get from work related activities translates into performance benefits for the company. The best way to make your employees think more innovatively is by recognizing their progress in meaningful work – no matter how small that progress is. Do You Want More Productive and Happy Employees? We have worked with companies such as LEO Pharma with the Progress Principle. If you would like to create more intrinsic motivation in your project team, consider doing an Innovation Culture Project with us. It is important that all the employees have a sense of ownership of the performance of the entire organization and a focus on the final customer. If they are focused only on their job, they may lose sight of the broader picture of the organization and how their job compliments the jobs of others in terms of creating customer value. In order for a culture of innovation to take hold, they should be shown the contribution of their individual work to the overall performance of the team, thus making them think more innovatively about their work being part of a process as opposed to a job on its own. Do You Want Your People to See the Bigger Innovation Picture? We have increased employee engagement by working with e.g. Rockwool. Consider doing an Innovation Project with us, if you want to increase employee engagement and develop useful new concepts. All employees come with their unique set of interests, talents and experiences. Implementing a culture of innovation requires that people to a large extent are allowed to follow their own interests and intrinsic motivation when they do their job. It would make greater contribution to their work. They would think more innovatively if they were allowed to build on their strengths in performing their job. The essence of allowing autonomy is that people would think more innovatively if you give them the freedom to build on their strengths rather than to improve their weaknesses. Do You Want to Involve Most of Your Organisation In Innovation? We have worked extensively with Roche Innovation Center Copenhagen, with innovation strategy and culture. We can certainly help you to create innovation at the strategic as well as the operational level, e.g. through an Innovation Strategy Project. 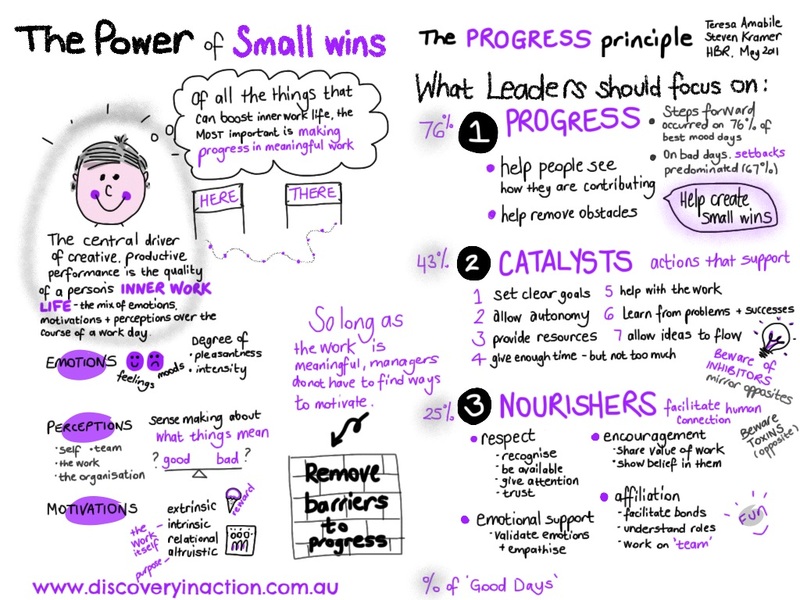 Read the HBR article “The Power of Small Wins” here.